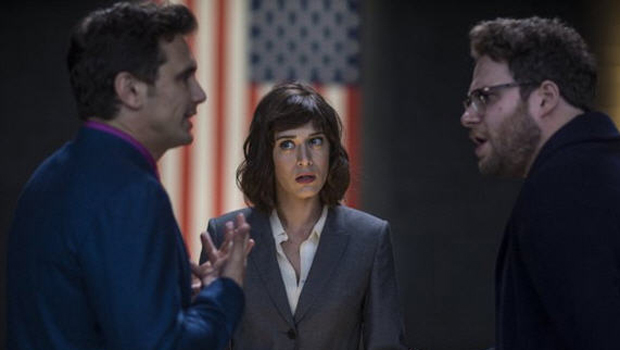 Sony Pictures' decision to pull the Dec. 25 release of its film "The Interview" sparked immediate reaction online, and celebrities are among those speaking out. The studio's decision came Wednesday, after numerous theater chains in North America dropped the film - which stars Seth Rogen and James Franco -- in the wake of hackers' threatened terrorist attacks. "Sony Pictures has been the victim of an unprecedented criminal assault against our employees, our customers, and our business. Those who attacked us stole our intellectual property, private emails, and sensitive and proprietary material, and sought to destroy our spirit and our morale -- all apparently to thwart the release of a movie they did not like," the statement continued. "We are deeply saddened at this brazen effort to suppress the distribution of a movie, and in the process do damage to our company, our employees, and the American public. We stand by our filmmakers and their right to free expression and are extremely disappointed by this outcome." Rob Lowe was among the first to take to social media to comment on the news, and others including Judd Apatow, Steve Carell, Patton Oswalt, Mia Farrow and Michael Moore soon joined in. Sony is a disgrace. Sickening. So every time anyone ever makes a threat to, say, a chain of stores, or all the airports in the country, we should shut 'em down? It's a damn shame #TheInterviewMovie is being pulled.